Honey alone can be used as a mask and is effective in curing acne by cleansing your pores and not letting microbes grow, due to its antimicrobial properties. Additionally, the waxy part of honey helps keep the skin soft, smooth and glowing. Application: Simply spread a layer on your face. Tips: Try to use filtered honey, rather than traditional cooking honey. Facts: Honey has antimicrobial properties, antioxidants and at the same time, is beneficially sticky. This stickiness pulls away the dust, dead skin, and microbes from the pores while the antimicrobial properties keep the skin from becoming infected again. The antioxidants in honey help make the skin look younger and finally, the wax makes the skin smooth, shiny, and moist. Caution: Those who are allergic to topical application of honey should not use this method. They continue to drip, even after application, and can create quite a mess on your floor or clothes. You won’t get the results overnight. 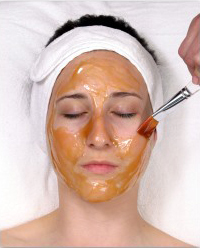 Honey and a few other ingredients used in these masks can be allergenic to some people. General Guidelines: Here are some points that apply for all types of honey masks. It is always best to use freshly prepared masks. Try to use organic ingredients as much as possible. Honey should be filtered. Raw, unfiltered honey may contain dust, pollen grains, hair found on the body of bees and their dead remains that may prove to be highly allergenic. Manuka Honey is said to be the best choice in terms of antimicrobial properties, which is why Manuka Honey Masks are considered the most effective. Whenever you rinse your face or other body parts after applying these masks, do not use any type of soap. In fact, soap is not recommended for the treatment of acne, since the problem goes far beyond simple dirt or oil. After you rinse your face with lukewarm water, wash it again with cold water a few minutes later. This will tone your face and increase the firmness of your face muscles. Always test the ingredients for possible allergic reactions on a place besides your face. Wash your face, preferably with warm water or a natural cleanser (not soap) before applying your preferred mask. However, this is not essential or compulsory, and you can still get good results without this step. Availability: Although most of the ingredients used in the masks we explained are readily available (except Tea Tree Essential Oil and Kelp), there may be different levels of availability in different parts of the world. That being said, honey is typically available in almost every food store or grocer. Price: This is one of the best parts of this treatment! Most of the ingredients discussed above are already available in the majority of households, except Kelp and Tea Tree Oil which aren’t very expensive. Tea Tree Essential Oil may be costly, but it will be needed in very small quantities each time and you will not need to buy a new supply very often. History: Many of these masks have already been in use for hundreds of years as a traditional home remedy for skin conditions like acne. Next Bee Pollen – the New Zealand Superfood?